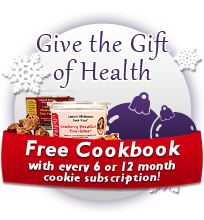 Laura’s Wholesome Junk Food is proud to introduce its “Give the Gift of Health” monthly subscription program. 2) Email us at info@lwjf.net and tell us how many months you want and where to ship them and the name of the lucky recipient. 3) Tell us the flavors you prefer or just say “Surprise me”. 4) We will send you an e-mail that requests payment and you can pay with a credit card or PayPal. 5) Tasty little bite-lettes will arrive at your or a loved one's doorstep. Each Case: six 7 ounce tubs, where each tub contains 14-15 cookies. That's about 90 moist little cookies / month! Give yourself or friends and family a 3, 6 or 12 month supply of healthy treats that taste great and are also good for them. Each month they will get a case of wholesome healthy cookies delivered to their doorstep for them to enjoy, use in their kids lunches or snack on pre-work out. Your gift will meet their sweet cravings in a healthy way.